Apple cider vinegar is a completely natural fermented liquid that has been used for its health benefits for thousands of years. This enzyme rich, pre-biotic health tonic possesses powerful antiviral, antibacterial and anti-fungal properties that can help to keep your cat fit and healthy. Ear Care - Cats, like most mammals, are very susceptible to ear infections with around one in four needing treatment at some point in their lives. Apple cider vinegar offers a completely natural solution to this issue that would normally require the use of antibiotics and involve costly visits to the vet. Simply add a few drops to your cat's infected ear each day, this helps to reduce inflammation and disinfect the ear. Daily Tonic - We are huge advocates of the use of apple cider vinegar for pets and humans alike and there is no better way to take advantage of the amazing array of benefits it can offer than to find a way to include it in your daily diet. For cats, the best way to do this is add two tablespoons to your pets wet food. This will offer your cat a wide range of vitamins and minerals that can help to protect their joints and eyesight. Fleas and Ticks - If there is one thing fleas really do not like, it's apple cider vinegar. The natural acids found in ACV act as a strong deterrent to these uninvited hitch-hikers, and making a flea spray is easy. Make an even apple cider vinegar to water mix and add to a spray bottle. This can then be applied to your cat using a fine mist setting. If your cat already has a serious problem with fleas, essential oils can be added to increase effectiveness. Skin Issues - Cats are prone to both bacterial and yeast based skin infections that often require expensive treatments. 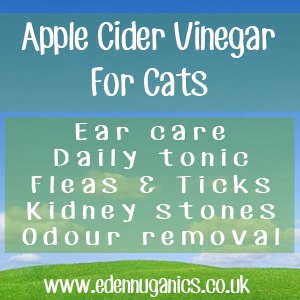 Apple cider vinegar is a simple and effective treatment for all feline skin conditions and can be applied using a wet sponge or spray bottle. It is best to dilute the vinegar down slightly before allowing it to contact your cat's skin. Odour Removal - Where cats go at night is still largely a mystery for most of us. However, the odours they bring back often give us an unwanted indication. If you're fed up with your cat smelling unpleasant, try apple cider vinegar as a fast acting natural deodorant. Slimming Agent - If your cat has piled on the pounds on their way into old age, a great remedy is adding apple cider vinegar to your pet's water bowl. Only a little amount is needed. The apple cider vinegar will reduce hunger in your cat as well as offering extra energy. Bladder and Kidney Stones - Kidney and bladder stones can be a real problem with cats and often involve risky surgery. Luckily the natural acids found in apple cider vinegar help to break down these hard intestinal stones while still inside the body enabling your cat to pass them away naturally with urine. Remove Urine Smells - If your cat has ever urinated on your carpet or soft furnishings, you will know how tricky it can be to remove this awful odour. Apple cider vinegar can be mixed with warm water and soap and used to clean these problem areas. The natural acids in the vinegar help to neutralize nasty odours and leave your home smelling fresh once more. Why is raw ACV best? A question we often get asked is "What type of apple cider vinegar should I use?" Our answer is always the same. When purchasing apple cider vinegar, you want to be looking for bottles with a floating cobweb like structure. This is known at 'the mother' and is a sign of good quality ACV. In addition to the mother, make sure your vinegar is raw, unfiltered and unpasteurized. Apple Cider Vinegar and Cats?